Dr. Steven Chen, a son of immigrants and a second generation Taiwanese American, shares his thoughts and story on the relationship of art and science with host Jovelyn Richards. They explore the notion of integrating healing modalities, along with Dr. Chen’s latest involvement with “food farmacy” produce prescriptions. 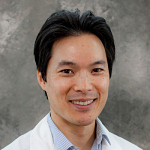 Steven Chen, MD, is the Medical Director at Hayward Wellness, one of the ambulatory clinics in the Alameda Health System – Alameda County’s safety net system of health. His areas of interest include integrative medicine, social justice and healing justice, and innovative models of care. At Hayward Wellness, he has worked to develop a Food is Medicine program that utilizes a “food farmacy”, produce prescriptions, group visits in a demonstration kitchen, and a cutting edge curriculum to broaden the mindsets of doctors to use food as medicine. His current work focuses on developing a model to better address social determinants of health in the exam room and in the clinic. As a son of immigrants and a second generation Taiwanese American, Dr. Chen recognizes the importance of language access, and he continues to develop more fluency in Taiwanese, Mandarin Chinese, and Spanish to better serve our communities. Dr. Chen grew up watching his immigrant parents and extended family struggle to navigate life in this new setting. Their experiences mirrored so many of his patient’s experiences: elders with no English trying to navigate the maze of health care, and parents and children divided by language and culture. All of this contributed to his desire and commitment to serve underserved communities.